Christ the King, known as Cristo Rei, is a Catholic statue and monument dedicated to the Sacred Heart of Jesus Christ. It overlooks the city of Lisbon in the central part of Portugal. The shrine was inspired by the Christ the Redeemer statue in Rio de Janeiro, after the Cardinal Patriarch of Lisbon visited that monument. 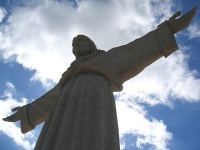 Like the iconic Christ the Redeemer in Rio, the Cristo Rei spreads its massive arms as if to embrace all of Lisbon. Situated on the bank of the Tejo River opposite the city, the statue is over 328 feet (100m) tall and provides amazing panoramic views of the city from the top.